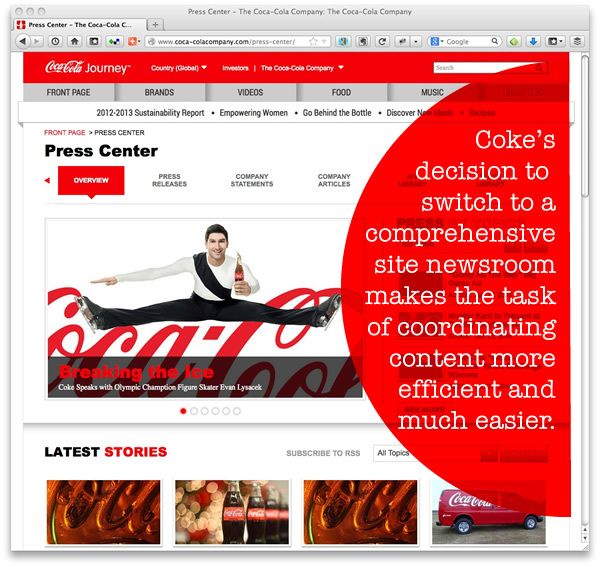 When Coke recently announced they were moving responsibility for product publicity from traditional PR announcements to a dedicated online newsroom as part of a revamped web site, it got my attention. His message, “What I want to do is kill the press release,” isn’t difficult to decipher. “We can't talk about what Coke wants to talk about,” Brown told his audience. “We have to talk about what people want to talk about." Much of what he referenced involved the critical role of video, vblogging, and native content used to define Coke’s brand, including the many international editions of Coca-Cola Journey, their digital pub launched late in 2012 and which in 2013 published over 1,200 articles that attracted over 13-million readers. With the realization that content consumers are looking for much more than “For Immediate Release” Coke recently rattled windows with their decision to phase out the traditional press release, concentrating instead on a comprehensive online newsroom to serve content. The word’s pretty much out about the need to engage socially. What’s also becoming clear is the need for a solution to keep your professional public up to date on what you’re doing. For the past several years all the media buzz has been about social channels one-size-fits-all solution to distributing corporate communications. But as any community manager worth their metrics will tell you, that’s simply not the case. Washington Post writer Steven Overly says that a social media marketing strategy is best served by building a central location (newsroom) on your web site to deliver what you’ve got going on socially. Those assets are usually hidden behind a series of drop down nested menus with short labels and cryptic descriptions. For journalists, researchers and just plain readers, this doesn’t meet the convenience test. Most web sites are a loose collection of more or less randomly arranged pages on a variety of topics: about, contact, projects and products, clients maybe, perhaps a press release directory all its own. Those assets are usually hidden behind a series of drop down nested menus with short labels and cryptic descriptions. For journalists, researchers and just plain readers, this doesn’t meet the convenience test. In a new survey PRESSfeed reports that while over 80% of journalists want images and content, less than 40% of PR professionals are providing the stills and video to satisfy that demand. The technology exists (in the right hands) but too often the will to harness a visual medium lags well behind. Apple commemorated their 30th birthday – January 24, 2014 – by sending 15 crews on a global assignment to video 24 hours in the life of a planet running on Macs, armed only with iPhone 5s. More proof, if needed, of the importance of a well stocked online content resource. The primary goal of an online newsroom is to organize marketing and communications assets in one convenient location, with the contents clearly identified and for best results searchable. There is no standard solution in terms of design, but an image driven roadmap is very effective in guiding users to the materials they’re looking for. A simple site map solves the problem for a newsroom with little content. As the quantity, variety and quality of assets improves, more elaborate solutions are needed. I’ve set up a couple of online client newsrooms and really enjoy the process. From the purely utilitarian perspective they’re a one-stop shop for editors in a hurry looking for ready to use material and for me that means hotspot targeted visual hints. As for structure, URLs range from simple to sophisticated; content quantity could influence your choice and SEO is certainly a major consideration. Meritus•Media points out that the insatiable demand for online news creates a perfect opportunity for companies to serve both owned (advertising) and earned (public relations) media visually, via a properly constructed web portal. In the free webinar, Sally Falkow, APR, discusses how to SEO for rank in Google News, as opposed to the more general Google search. 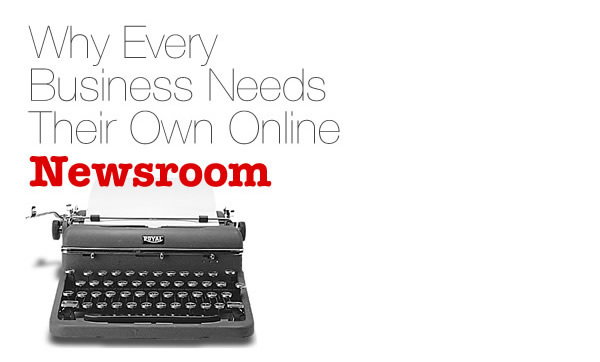 So What Fits In A Newsroom? Like every other aspect of digital communications, setup and administration of an online newsroom shouldn’t be approached from the, “So easy a (fill in the blank) could do it,” perspective. From design through setup, curation and administration, an online newsroom represents at every level what you want your public to see, hear and say about you and your brand. Leave it to interns? Only if you enjoy surprises. At its most basic, an online newsroom is nothing more than a database of the content you already have on hand, arranged in one central location. But in the context of a push-pull Search Engine Marketing (SEM) strategy, that database has to quickly solve a curious editor’s search for relevant material. It‘s all about design and structure. More likely, what doesn’t. Where once the footprint of tiny JPEGs had to be carefully weighed because of dialup modem speeds and the expense of disc space, the drastic decline in digital storage costs coupled with high speed internet access means that for all practical purposes the amount of content – text and visual – that can be stored and served is unlimited. Stills, videos, newsletters, catalogs, text only press releases alongside formated versions, PDFs, GIFs, audio – anything that can be rendered digitally is a candidate. Keep in mind, content can be located anywhere – the cloud comes to mind. What’s important is that the links be rock solid and checked occasionally (keep an eye on those 404s) for integrity. The benefits of a well thought out online newsroom are like a carefully contoured farm. Thoughtful prep at the beginning will yield years of plentiful bounty for those whose job it is to find and harvest quality ingredients. This work by John Siebenthaler is licensed under a Creative Commons Attribution-NonCommercial 4.0 International License.